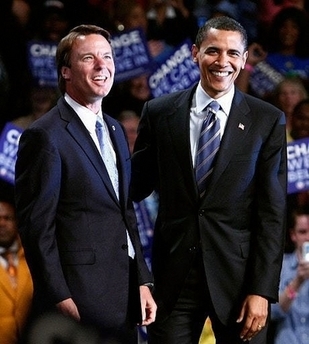 It’s easy now to dismiss John Edwards. But in early 2007, it was John Edwards whom Barack Obama had to best in order to be the primary opponent of the ‘inevitable’ Hillary Clinton. I had a front-row seat in that early contest between Edwards and Obama, in that my place of work (Weaver Street Market Co-operative) was situated across the modern equivalent of a village green from the office which housed Edwards’ National Campaign HQ, in Chapel Hill, NC. I’m fascinated to be reading David Plouffe’s book of his management of the Obama Campaign (“Audacity To Win”), not least because I’m able to compare his perspective, from inside the Obama camp, with what I was writing on my lighthearted Edwards’ Campaign blog at the time. And I gotta say this about our Dave. For a bloke who prided himself on being the anti-spin, he sure weaves in a lot of…um…interesting hindsight, let’s call it. I’ve just reached the moment in 2007 which we acknowledged at the time, and which Dave confirms in his book, was the first major milestone in the long two-year process. The March 31, 2007 reporting of the fund-raising totals for the first quarter of 2007. At the time, everyone – pundits, press, campaigns, public – everyone knew those totals would set the scene for the rest of the campaign. The figures would separate the men from the boys – or girls. The contenders from the pretenders. What I find interesting about what Dave says on this issue is not so much his view of the figures that were announced (which is not that different from mine at the time), as the almost complete absence of John Edwards from his build-up to those figures. Whatever we think of John now, the fact is that, from the moment of their respective announcements (John in late December 2006; Barack in early 2007), Edwards was the initial primary target of the Obama Campaign, not Clinton. Dave re-writes history a tad, bless his heart, pretending that the only worry was Clinton. But my own blog reminds me that this can not have been the case at the time. And Dave Boy is engaging in the very process he says he abhors: the audacity to spin. Let’s recap the situation on the ground in the run-up to March 31, 2007. Hillary was the heavyweight. She had the name. She had the money. She had the organization on the ground. She was the candidate to beat. And the bloke who had set out four years before to be the one to beat her was John Edwards, not Barack Obama. Now, Dave admits that Barack started late, and with precious little by way of comparison with Hillary. And he goes into great detail in his book about how little by way of comparison. But what he fails to mention is just how much more Edwards had than his candidate. Both Obama and Edwards knew that the only chance they had of denting the Clinton juggernaut was to win in Iowa and make a substantial showing in New Hampshire, and let momentum take over after that. Dave admits that Obama had nothing by way of a national organization or any kind of staff or volunteer effort in states after Iowa and New Hampshire (indeed, Obama had f*** all in Iowa or New Hampshire at the very beginning of 2007). The strategy was to pile everything into Iowa and New Hampshire and take it from there. Where disingenuousness enters the picture is the claim (by omission) that Edwards was in exactly the same boat. But that was not the case, and Dave knows it. Edwards had achieved a brilliant second place in Iowa in 2004. He was well liked there. He continued to visit Iowa throughout the following four years. And in early 2007 he was handsomely winning state-wide polls in Iowa. He was no neophyte struggling against Clinton – not in Iowa. Next, Edwards had maintained his national organization after 2004. And although it didn’t have the poke of Hillary’s, it was nevertheless a substantial national network of volunteers and potential state organizations. 2008 will always be remembered as the Election in which political social networking became a hugely viable tool in organizing volunteers, energizing the base and raising money. And we will always associate that fact with mybarackobama.com. But the fact is that, in early 2007, my.barackobama.com was basically nothing more than a dead-letter drop box. The poster-child for fancy interactive web-sites at that time was the Edwards’ web-site. It informed. It raised money. It had a community that blogged with itself and with others. Dave sets out in meticulous detail in the early part of his book what Obama’s strategists knew they had to accomplish before March 31, in order to be seen as a viable competitor to Hillary Clinton – a presence in Iowa and New Hampshire; the beginnings of a national organization of volunteers; a credible interactive web-site; and a plan. Obama and his staff had a plan. They had decided the way to distinguish themselves from Hillary was to position themselves as change versus her experience and ‘inevitability.’ Edwards also knew that he had to distance himself from Hillary if he was to have a chance of overtaking her. He chose the path of appealing to the party base of liberal bloggers and trade unionists. But while Dave claims that he and Obama were succeeding in their efforts to position Obama as the only viable contender for Clinton in the run-up to March 31, the fact is that it was Edwards who held all the cards, and it is for this reason I claim Dave is being a little…hmm…we call it ‘naughty’ in England. And that brings us to the last piece of the jigsaw puzzle of naughtiness. Dave says in his book (I said in my blog): March 31 was going to be the make or break date for every campaign. Now Dave’s information at that time can not have been worse than mine. And even I knew the Edwards’ Campaign was putting it around that their find-raising total for the first quarter of 2007 would be $20 million. Dave says in his book that he expected the Obama Campaign to raise $12 million. Leave alone all the other strengths of the Edwards’ campaign, that information of itself would have meant that the Dave and the rest of the Obama Campaign knew in the run-up to March 31 that the initial target of their Campaign was Edwards. John occupied the second if not indeed the first place in the Democratic race. Obama had to get past John to get to Hillary. And Dave does not describe the race at that time in those terms. Naughty Dave. I trust your recollection gets a bit better as the book continues. And watch this space for my updates on that score. Now, I just popped off to attend to nature. And while nature was having it way with me, I got to thinking. I don’t like untidiness. My mind constantly looks for pattern and rationale. And this omission of Dave’s just does not make any sense. Indeed and ironically, it’s that very same search for pattern and rationale which was the basis for my extended blog on the Edwards’ Campaign. Once I began writing my blog, I realized there was something which just did not add up about John’s Campaign. There was a disconnect between what he was saying and what he was doing. Of course, we all now know why that was. And that’s sort of my point about Dave. What little I know off David Plouffe leads me to respect him as a talented organizer and a straight shooter. Which makes my confusion on this issue all the more puzzling – at least for me. We all know that John self-imploded during 2008 (more of that in later installments of ‘Plouffe Stuff’). But is that really enough reason for Dave to be so pissed that he totally dismisses the status of the entire Edwards’ Campaign in early 2007? Be pissed at John, yes. But completely diss all the good folks who put together John’s superb Campaign? No. Don’t see it. So what else is or was going on? Well, I’m sure the folks who were with Edwards and Obama at that time know way more than me. But a little guess-work is always fun. I’ve just explained, in so many words, that, at the beginning of 2007, and in fact pretty much through 2007 and all the way to the February 2008 Super Tuesday, Edwards had what Obama wanted – a functioning interactive web-site; a vast and inter-connected national network of committed volunteers; money-raising potential; not to mention a detailed platform of policy, credibility with the liberal bloggers, and strong relationships with trade unions. Yet, when Edwards withdrew precipitately (and more of that later, too) just before Super Tuesday, he did not at that time, nor in fact at any useful point did he ever, ‘hand over’ all of the above to Obama in any kind of formal way. NB By the by. Dave reminds us that while Hillary announced her figures on April 1, 2007, Obama deliberately withheld his figures until April 3, in order to elevate interest by way of suspense. And Dave claims the ruse worked. Well. Dave. Bless your heart – again. It may have amused the oldtime political poker players in Washington. But it left us ordinary folk in the country completely bewildered. As I said that the time, it betrayed a level of political naivety at a time when your Campaign was looking to establish credibility. For two whole days, you let the Clinton Campaign control the headlines. Got to disagree with you on that ploy, Dave. It was a mistake.